Has there ever been a time in your life when God placed certain people on your path to make it apparent you are supposed to do something specific? Dr. David Reagan and I were blessed by having Michael Norten as a guest on our television show Christ in Prophecy. Michael is a Dallas Theological Seminary graduate, formerly a pastor and staffer with Campus Crusade for Christ, and the television personality the Garden Guy. He's written an absolutely fascinating book on the Feasts of Israel titled Unlocking the Secrets of the Feasts, explaining what each one means and how they are prophetically significant. I believe you'll find the following interview with Michael concerning the prophetic importance of the Feasts that relate to the First and Second Comings of the Messiah a fascinating read. Dr. Reagan: Ever since the Law of Moses was given to the Jewish people about 3,500 years ago, they have been observing a system of seven Feasts — four in the Spring of the year and three in the Fall. They continue to observe those Feasts today. The Feasts relate to the agricultural cycle, but they are also memorials of great events in Jewish history. Nathan Jones: Welcome, Michael! You teach on both the Feasts and gardening. I can see a combination going here. Michael Norten: It all comes together. Dr. Reagan: I'm so excited about your book, Unlocking the Secrets of the Feasts. The subtitle is, The Prophecies in the Feasts of Leviticus. One of the things that really hooked me on your book when I started reading it was that you actually came to me before you had it published and had me read the manuscript. At that time you didn't have the preface yet. When I finally got the finished book and I read the preface, I think I laughed for the next 30 minutes, because you told three stories: 1) How you got interested in prophecy. 2) How you got interested in the Feasts. 3) How you got interested in writing. Tell us those stories. 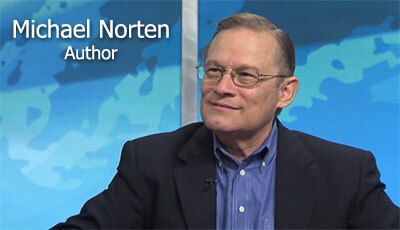 Michael Norten: It was an interesting journey how I came to write a book on the Feasts of Israel. To begin, I decided when I was in college back in the 60's that I wanted to take an adventurous train trip to Mexico City. It was basically a missions trip. Everyone before I left warned me, "Oh, you've got to be careful for there are desperados and they rob people on the trains." I had a big imagination and so I became very nervous. Once on the train for two days from Loredo to Mexico City, I spent it looking around in the hopes of spotting those desperados before they spotted me. What I saw was a gentleman who had long-hair, a big mustache, and a stern look on his face. He clearly had been around the block a few times. I thought, "There's one of those desperados." As I was watching him, I noticed some people were coming up to talk to him. I thought, "Now this is interesting, for they may be planning their heist." I sort of walked over to find out what they were talking about thinking I would recognize some Spanish. To my suprise, he was talking about Bible prophecy. He was talking about the Rapture, the Tribulation period, and the Millennial Kingdom. I thought, "This is interesting." So, I started asking him questions. I even asked him where I could learn more about all this prophecy? He said, "You might start by going to Dallas Theological Seminary." This "desperado" finally introduced himself as Hal Lindsey! Later on I did go to Dallas Seminary. Once there, one day I decided with a bunch of our friends to go out to lunch after church at this place called Shakey's Pizza. There people, friends, and strangers alike would all sit together at the same table. As I was sitting at the big table, there was a gentleman sitting right in front of me. He was a bald headed gentleman who had a sheepish grin on his face, and to my surprise smoke coming out the back of his head! I asked him, "Sir, do you realize there is smoke coming out of the back of your head?" He got so embarrassed. He then pulled out this cigarette from behind his back. He replied, "I'm a Jew who has just accepted Jesus as my Messiah. I believe in Jesus as my Messiah. I didn't know what church people thought about smoking. When I saw you church people come in, I decided to hide it." We had a laugh over that. I asked this man, "What brought you to believe in Jesus as your Messiah?" He told me it was from reading Bible prophecy and how those prophecies were fulfilled. This was fascinating, how he came to see this. As we were leaving he says, "Oh, by the way, the secrets of prophecy are in the Feasts." That lodged in my memory. All the secrets are in the Feasts. This gentleman I came to discover was Zola Levitt! Dr. Reagan: Oh, no. This was shortly after he had become a Christian? Nathan Jones: Fascinating that so shortly after Zola became a Christian he had already recognized the prophetic significance of the Feasts. Dr. Reagan: If some folks don't know, Zola Levitt later became one of the leading Messianic Jewish teachers and television personalities in America. So, Michael, you were introduced to prophecy by Hal Lindsey. You were introduced to the Feasts by Zola Levitt. What was your third encounter? Michael Norten: Quite a number of years later, I was sitting in a restaurant here in Texas. I noticed that a gentleman who was sitting at a table next to mine was Tim LaHaye, because I recognized him from the Left Behind series of books. So, I started talking to him about prophecy. Obviously I have to talk about something, for here he was. Up to that time I was pretty ignorant concerning the Jewish Feasts. At one time I had been asked to teach a series of seven lectures on the Scriptures. I thought, "Well, there are seven Feasts, so with seven lectures, teach on the Feasts." I realized I didn't know really anything about the Feasts. I had asked my colleagues, and they didn't know anything about the Feasts. I had went to the rabbis, some Messianic and some non-Messianic, and asked if they'd please teach me about the Feasts. They were the ones who poured out their hearts to me. I started connecting the dots. I had thought I'd found the mother lode. It was such exciting information. I started sharing with Tim LaHaye what I had learned about the Feasts. He said, "We've never heard this. We are not taught this. You need to write a book for this is incredible." Well, I had never written a book. Tim LaHaye offered, "Let me teach you how to write a book." Amazed, I thought, "This man has sold more books than Harry Potter, and he's going to teach me how to write a book!" We sat down and he did just that. So, that's the long path I took and the people who encouraged me to write my book Unlocking the Secrets of the Feasts. Dr. Reagan: Wow! I tell you, I can just see the Lord's hand in all of that. Hal Lindsey introduced you to prophecy. Zola Levitt introduced you to the Feasts. Then you ran across Tim LaHaye who has this heart for writing and touching people's hearts through writing, and he encourages you to write. And so, you wrote. Michael Norten: That's right. Now I teach the Feasts and encourage people to read about the Feasts. What I've learned from the rabbis, well, they are just as excited about them as I am. In the second segment of our interview with Michael Norten concerning the Feasts of Israel, Michael will give us an overview of what the Feasts are and when they occur. Will this book be available via L&L? No, sorry, Billy. Michael Norten isn't a non-profit, so by network advertising requirements we couldn't directly promote his book. It's easy enough to find on Amazon and other places, though. One of the best and easiest books I've read in awhile!